The ____________ allows you to access object and start programme? The Start Menu allows you to access object and start programme. The Start menu is a feature of the Windows operating system that provides quick access to programs, folders, and system settings. By default, the Start menu is located in the lower-left corner of the Windows desktop. In Windows 95 through Windows XP, the Start menu can be opened by clicking the "Start" button. 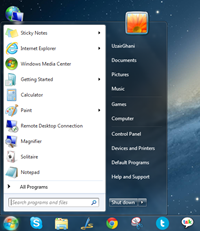 In newer versions of Windows, such as Windows Vista and Windows 7, the Start menu can be opened by clicking the Windows logo. Some keyboards also have a Windows key that opens the Start menu when pressed. The Mouse Pointer takes different shapes, depending on the task you perform. 2) where the next character typed will be entered in a line of text. The mouse cursor is most often an arrow that you can use to point to different objects on your screen. When the cursor is over an object, you can click or double-click the mouse button to perform an action on that object (such as opening a program). The mouse cursor can change into other images, such as a small hand (when you roll over a link in a Web page), or an hourglass (when Windows is "thinking" so hard, it won't let you click on anything). A microprocessor is the brain of the computer and is also called a(n) ………. A microprocessor is an electronic component that is used by a computer to do its work. It is a central processing unit (CPU) on a single integrated circuit chip (microchip) containing millions of very small components including transistors, resistors, and diodes that work together. Computer input is whatever is typed, submitted, or transmitted to a computer system. Information is input into a computer it becomes data because computer data is information required by the computer to be able to operate.